When 100 mile per hour winds lash the coastal cities of Texas and 40 to 50 inches of rain are dumped on the city of Houston and the surrounding environs, it has all the markings of a natural disaster. 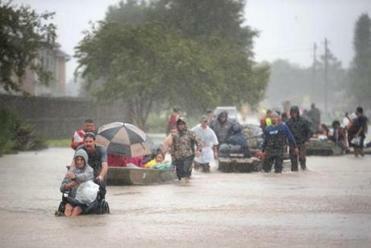 But make no mistake, Hurricane Harvey and the devastating flooding that it is leaving in its wake is a man-made calamity. Harvey is now the third so-called 500-year flood to hit Houston in just the past three years. That’s not some weird weather quirk, but a direct result of state, local, and federal policies that have turned increasingly routine fearsome weather events into full-fledged catastrophes. While it’s difficult to blame a single weather event on global warming, the link between climate change and Harvey’s intensity is impossible to ignore. As the climate warms, sea water warms as well, which means greater evaporation, putting more moisture in the air and raising rainfall totals. Indeed, this past winter the temperature in the Gulf of Mexico, which abuts the Texas Gulf Coast, never dipped below 73 degrees. This leads to rainstorms of greater intensity and scope — a phenomenon that is occurring globally. Indeed, at the same moment that Houston is being lashed by nearly five feet of rain, Mumbai, India, is experiencing similarly intense monsoon rains and citywide flooding. As global temperatures continue to rise, events like Harvey will be replicated around the world. Black, white, Hispanic, and Asian residents working together. Straight and LGBT; citizens and the undocumented. Does President Trump recognize this America? However, inaction by local officials in Houston has exacerbated these problems. Last year Pro Publica and the Texas Tribune cowrote a major expose that presciently predicted the impact of Harvey. The article laid out in numbing detail Houston’s failure to ameliorate the impact of the storms that are a regular feature of the coastal city — and its reluctance to accept the reality that major, transformational changes are needed. 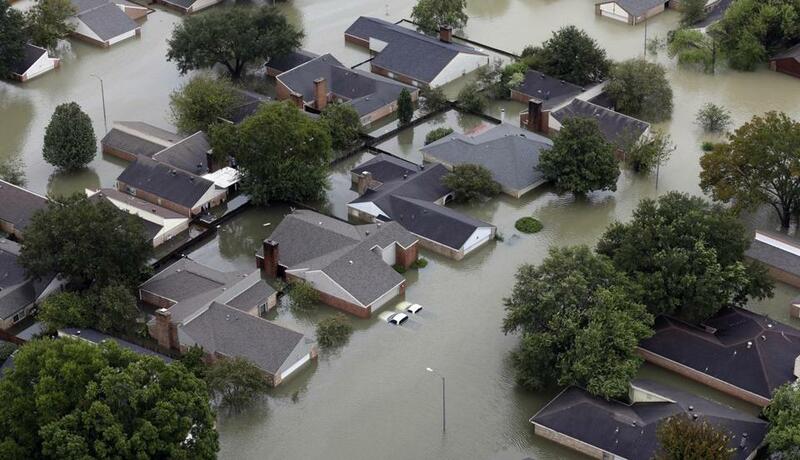 By allowing unchecked real estate development, paving over wetlands (30 percent of such land was lost between 1992 and 2000) and building impermeable surfaces (i.e., land that doesn’t soak up water, which has increased by 25 percent over the same period), Houston has ensured that the rising number of storms from climate change are that much worse. Much of the development is occurring in areas that had long been considered unlikely to flood, but as rainfall intensity has increased are now experiencing regular and catastrophic floods. Not surprisingly, Mumbai’s flooding problems have been exacerbated by the same mistakes. Finally, as Michael Grunwald points out in Politico, by largely subsidizing construction and reconstruction in flood-prone areas, the federal-run National Flood Insurance Program has contributed to the calamitous impact of rising rainfall rates and warming temperatures. Relatively cheap flood insurance encourages developers to build in areas that are unusually susceptible to serious flooding, and by paying for reconstruction after the rain does fall, the flood program ensures that such problems will be repeated over and over again. One recent study by the Pew Foundation found that 1 percent of flood properties have experienced repeat losses, which accounts for a quarter of all national flood claims. As if to add insult to injury, last week President Trump — in a gift to developers — revoked an Obama administration order tasking federal agencies to take into account the potential for flooding when building new infrastructure projects. Storms like Harvey are going to happen. But such storms need not be so intense and so damaging and their effects can be ameliorated. We’ve largely reached the point at which Band-aid policies will no longer do. Global warming and extreme weather events are our new normal. The way coastal cities are designed, the scope of modern development, how buildings are constructed, how we transport ourselves and live our lives all need to be rethought. Humanity is facing a future of warmer temperatures, higher seas, and more Harveys and, as we’ve seen in Houston this week, we’re not prepared for the deluge to come.